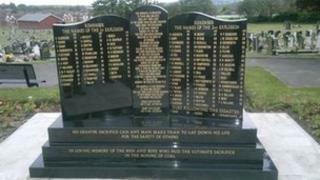 A memorial has been unveiled to mark the 100th anniversary of the Cadeby Main mining disaster. Two explosions at the colliery, near Doncaster, on 9 July 1912 left 91 miners dead. Fundraising for memorials at Denaby and Conisbrough cemeteries, where most of the victims are buried, began in 2011. A parade travelled from the former colliery site, which closed in 1987, to the cemetery at Denaby where the memorial was unveiled. Churches at Conisbrough and Denaby and throughout the Dearne Valley rang their church bells 91 times in memory of the victims as the parade began. The oldest surviving relative of those killed, 94-year-old Irene Newton, unveiled the memorial to the men killed a century ago. Several other relatives and descendants of the victims took part in the parade and laid flowers at the memorial. A second memorial at Conisbrough Cemetery, where 29 victims are buried, will be unveiled on Monday at 11:30 BST.